The members - many from business - have a good social life whilst working to provide for others - locally, nationally and globally. We can provide guidance, financial aid and support. This is simply the story behind what the club and members do. 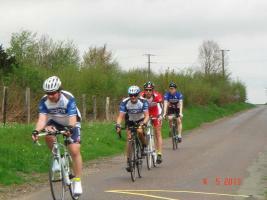 A casual charity bike ride starting in Poundbury - Dorchester - to the town's twin of Bayeux. For the Air Ambulance. 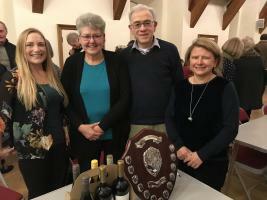 The club runs a few quiz nights during the year, and all funds are used for the club's charitable purposes. Dorchester Poundbury Rotary club started in 2013, and is service club for men and women striving to uphold the ethos of Rotary International while being very relaxed and contemporary in structure. The club meets every Friday at The Cafe on the Green in Poundbury from 7-30 to 8-30 for a breakfast meeting of toast, croissants and coffee. The ages of members ranges from 26 - 80. There is a wide mixture of occupations from stockbrokers, solicitors and bankers to builders, reflexologists and teachers. Poundbury Rotary Club is an excellent way of supporting the local and international community with fundraising charitable projects, and offering help in terms of service to people and organisations. It offers a great way of networking and meeting business and professional men and women in the Dorchester area. There is also a big emphasis on socialising and having fun!